I have regularly seen Java programmers and developers of various experience level, who have either never heard about these OOP and SOLID design principle, or simply doesn't know what benefits a particular design principle offers and how to apply these design principle in coding. To do my part, I have jotted down all important object-oriented design principles and putting it here for quick reference. These will at least give you some idea about what they are and what benefit they offer. I have not put examples, just to keep the article short but you can find a lot of examples of these design principles in my blog, just use the search bar at the top of the page. If you are not able to understand a design principle, you should try to do more than one example because sometimes we connect to another example or author better but you must understand these design principles and learn how to use it in your code. 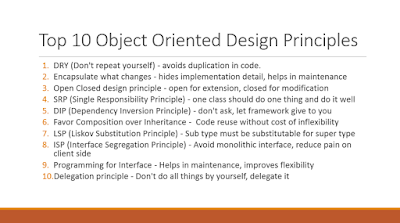 Another thing you can do is to join a comprehensive object-oriented design course like SOLID Principles of Object-Oriented Design by Steve Smith on Pluralsight. It has helped me a lot in my understanding and application of these principles. Though best way of learning any design principle or pattern is a real-world example and understanding the consequences of violating that design principle, subject of this article is Introducing Object-oriented design principles for Java Programmers, who are either not exposed to it or in the learning phase. Our first object-oriented design principle is DRY, as the name suggests DRY (don't repeat yourself) means don't write duplicate code, instead use Abstraction to abstract common things in one place. If you have a block of code in more than two places consider making it a separate method, or if you use a hard-coded value more than one time make them public final constant. The benefit of this Object oriented design principle is in maintenance. It's important not to abuse it, duplication is not for code, but for functionality. It means if you used common code to validate OrderID and SSN it doesn’t mean they are the same or they will remain the same in future. By using common code for two different functionality or thing you closely couple them forever and when your OrderId changes its format, your SSN validation code will break. So beware of such coupling and just don’t combine anything which uses similar code but are not related. You can further check out Basics of Software Architecture & Design Patterns in Java course on Udemy to learn more about writing good code and best practices to follow while designing a system. Only one thing is constant in the software field and that is "Change", So encapsulate the code you expect or suspect to be changed in future. The benefit of this OOP Design principle is that It's easy to test and maintain proper encapsulated code. If you are coding in Java then follow the principle of making variable and methods private by default and increasing access step by step e.g. from private to protected and not public. Several of the design patterns in Java uses Encapsulation, the Factory design pattern is one example of Encapsulation which encapsulates object creation code and provides flexibility to introduce a new product later with no impact on existing code. Btw, if you are interested in learning more about design patterns in Java and Object Oriented Programming then you must check this Design Pattern Library course Pluralsight. It's one of the best collection of design patterns and advice on how to use them in the real world. Classes, methods or functions should be Open for extension (new functionality) and Closed for modification. This is another beautiful SOLID design principle, which prevents someone from changing already tried and tested code. Ideally, if you are adding new functionality only than your code should be tested and that's the goal of Open Closed Design principle. By the way, the Open-Closed principle is "O" from the SOLID acronym. Single Responsibility Principle is another SOLID design principle, and represent "S" on the SOLID acronym. As per SRP, there should not be more than one reason for a class to change, or a class should always handle single functionality. If you put more than one functionality in one Class in Java it introduces coupling between two functionality and even if you change one functionality there is a chance you broke coupled functionality, which requires another round of testing to avoid any surprise on the production environment. You can further see From 0 to 1: Design Patterns - 24 That Matter course on Udemy to learn about patterns which are based on this principle. Don't ask for dependency it will be provided to you by the framework. This has been very well implemented in Spring framework, the beauty of this design principle is that any class which is injected by DI framework is easy to test with the mock object and easier to maintain because object creation code is centralized in the framework and client code is not littered with that. There are multiple ways to implemented Dependency injection like using bytecode instrumentation which some AOP (Aspect Oriented programming) framework like AspectJ does or by using proxies just like used in Spring. See this example of IOC and DI design pattern to learn more about this SOLID design principle. It represents "D" on the SOLID acronym. Always favor composition over inheritance, if possible. Some of you may argue this, but I found that Composition is the lot more flexible than Inheritance. Composition allows changing the behavior of a class at run-time by setting property during run-time and by using Interfaces to compose a class we use polymorphism which provides flexibility to replace with better implementation any time. 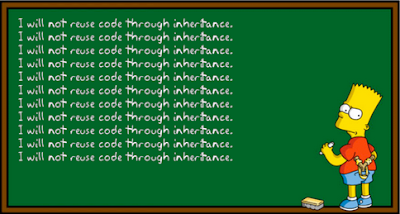 Even Effective Java advise favoring composition over inheritance. See here to learn more about why your Composition is better than Inheritance for reusing code and functionality. 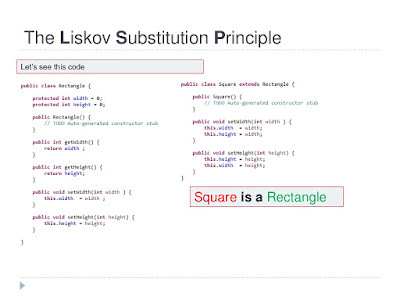 According to the Liskov Substitution Principle, Subtypes must be substitutable for supertype i.e. methods or functions which uses superclass type must be able to work with the object of subclass without any issue". LSP is closely related to the Single responsibility principle and Interface Segregation Principle. If a class has more functionality than subclass might not support some of the functionality and does violate LSP. In order to follow LSP SOLID design principle, derived class or subclass must enhance functionality, but not reduce them. LSP represents "L" on the SOLID acronym. If you are interested in a more real-world example, then the SOLID Principles of Object-Oriented Design course on Pluarlsight is a good course to start with. 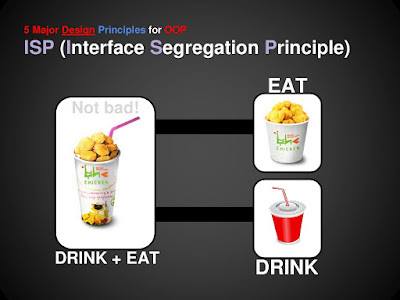 Interface Segregation Principle stats that, a client should not implement an interface if it doesn't use that. This happens mostly when one interface contains more than one functionality, and the client only needs one functionality and no other. Interface design is a tricky job because once you release your interface you can not change it without breaking all implementation. Another benefit of this design principle in Java is, the interface has the disadvantage of implementing all method before any class can use it so having single functionality means less method to implement. 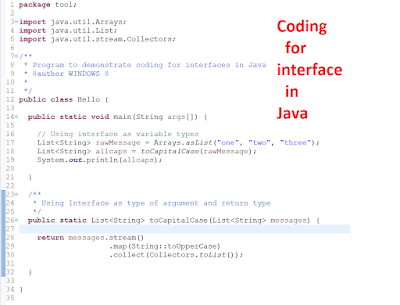 If you don't the get the benefit of the interface in coding then I suggest you read my blog post, the real usage of an interface in Java to learn more. Always program for the interface and not for implementation this will lead to flexible code which can work with any new implementation of the interface. So use interface type on variables, return types of method or argument type of methods in Java. This has been advised in many Java books including in Effective Java and Head First design pattern book. Don't do all stuff by yourself, delegate it to the respective class. 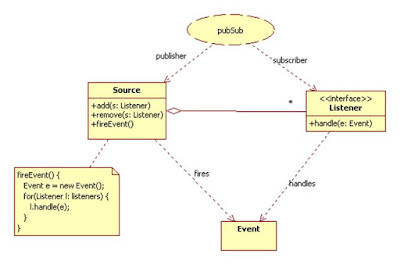 Classical example of delegation design principle is equals() and hashCode() method in Java. In order to compare two objects for equality, we ask the class itself to do comparison instead of Client class doing that check. The key benefit of this design principle is no duplication of code and pretty easy to modify behavior. Event delegation is another example of this principle, where an event is delegated to handlers for handling. All these object-oriented design principles help you write flexible and better code by striving high cohesion and low coupling. The theory is the first step, but what is most important is to develop the ability to find out when to apply these design principles. Once you get hold of that, the next step is to learn Design patterns in Java, which uses these design patterns to solve common problems of application development and software engineering. If you are looking for a nice course to start with, I suggest you join the From 0 to 1: Design Patterns - 24 That Matter - In Java course on Udemy. It's very comprehensive and you can get it in just $11 on their several flash sales. 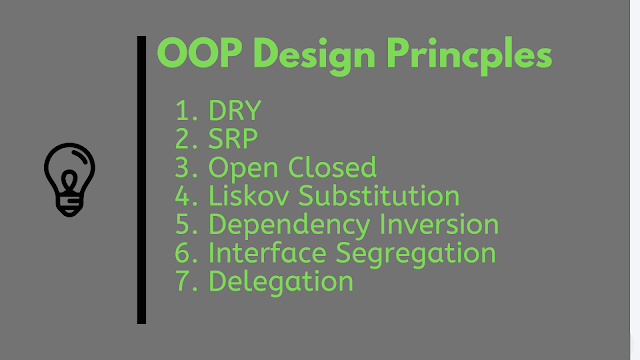 Anyway, here is a nice summary of all these OOP design principles. Find out, whether we are violating any design principle and compromising flexibility of code, but again as nothing is perfect in this world, don't always try to solve the problem with design patterns and design principle they are mostly for large enterprise project which has longer maintenance cycle. Bottom line is, professionals programmers should always strive for a highly cohesive and loosely couple solution, code or design. Looking open source code from Apache and Google are some good ways of learning Java and OOP design principles. 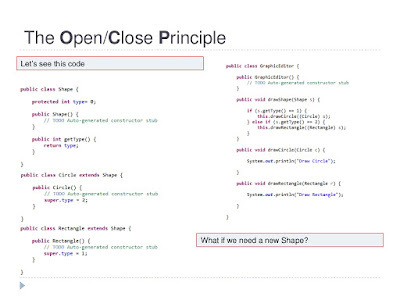 They show us, how design principles should be used in coding and Java programs. Java Development Kit follows many design principles like Factory Pattern in BorderFactory class, Singleton pattern in Runtime class, Decorator pattern on various java.io classes. Not many programmers know this book because it is often shadowed by its more popular cousin Head First Design Pattern by Eric Freeman, which is more about how these principles come together to create a pattern you can use directly to solve known problems. These books help a lot to write better code, taking full advantage of various Object-oriented and SOLID design principles. Btw, if you really interested more in Java coding practices then read Effective Java 3rd Edition by Joshua Bloch, a gem by the guy who wrote Java Collection API. Thanks for reading this article. If you find these object-oriented design principles useful then please share with your friends and colleagues. If you have any questions or feedback then please drop a note. Excellent Article.....!!!! !but these concepts can be learned by experience...Hopefully I am trying to applying the things which I learnt. 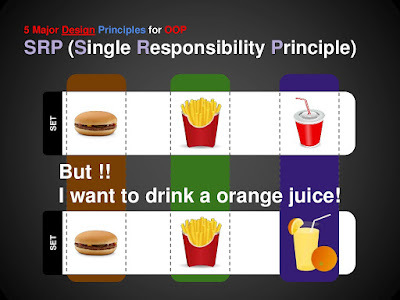 But I hope you are going to post few articles regarding the OOPS concept and design principles. awesome blogs .. Hats of to you Javin....You are taking this to a whole new level..I was asked this question in a BNY /Mellon interview and i wish i could answer it this clearly!!!! Very simple great impact !!! 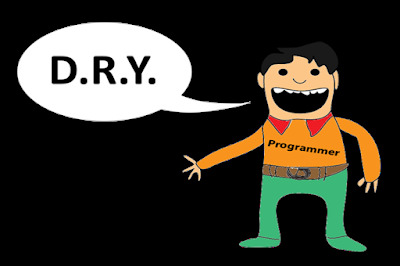 DRY is not exactly an object oriented principle, isn't it? Nor is it one of the SOLID principles. Dependency injection and Inversion (of Control) are not equal. Moreover you do not need a framework to do dependency injection. As its name suggests ISP is rather the other way round: Break up a single (big) interface into small ones. Maybe you meant the right thing and your definition is just confusing. Equals() and hashCode() are good examples of encapsulation and information hiding rather than delegation. "... design patterns and design principle ... are mostly for large enterprise project which has longer maintenance cycle"
That is like saying a healthy lifestyle is only important for athletes. You seem to confuse basic patterns and principles with sophisticated designs. Plus: The length of a maintenance cycle does not correlate with the size of a project. It's good for less experienced developers, though, to see many important principles in one place. Keep on going. @Anonymous, Thanks for your comment. DRY (Don't repeat yourself) is more of pattern derived from Experience, but its mostly referenced along with other SOLD design principles. Regarding DI, isn't it an example of Inversion of Control where dependency is injected by external source like Spring framework instead of hard coded, though I agree that you can write your own framework to implement Dependency Injection but I still see better to use Spring framework than creating your own as you can never get same level of testing, quality and stability as front line open source project like Spring gains. Regarding equals() and hashCode() indeed they better fit and example of encapsulation rather than delegation. Anyway Thanks for your input and comment, keep it coming. KISS (Keep it Simple, Stupid)- KISS design principle says that that most software, program works well if they are made simple rather than complex. YAGNI - You are not going to need it, is an extreme programming design principle which states that don't build any functionality until you need it. this is best to remove dead code or not utilized code from your project. 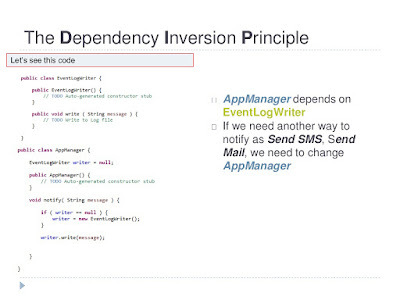 Please don't confuse dependency inversion (DIP) and dependency injection - they are two totally different principles. See http://martinfowler.com/articles/dipInTheWild.html for explanation. Hello there, what is difference between design principle and design patterns? Can you please describe? Basically design principles are the base on which design patterns get created to solve a problem. HI Javin, Please try to post an article Design Principles Vs Design Patterns? People often confusing about principles and patterns are same or not. Could be highly appreciate if you can post an article. good theory but can you publish practical programs of above 10 points.it will be helpful also. a great article, every java developer and designer must definitely read this. Good list, though I know these principles and patterns and what problem they solve, having them in one place is great job. In real life there are more principle, rules than these though, for example I would like to share one design pattern, principle or rule, call it whatever you like, which has benefited me lot in past. One of the keys to write robust and flexible software is to make sure that layers at the bottom that are reusable have no knowledge of the layers that use them. Great post. Explaining all in simple words. Thank you Neelesh and Deepak. why does is seem like people were replying to this post 5 years before it was posted? Because these design principles are still valid and will remain valid for coming years. I have also update the post regularly.